Welcome to our 18th episode in our newer podcast series where we cover everything related to investing in tax-delinquent real estate. We’ve done nearly 3,500 deals – in land and houses – with little competition and big profits. And we want to share what we know with you. In today’s episode, we’re talking about how to start selling and marketing those tax-delinquent properties – in other words – the principles behind building a buyer’s list. We touch on every detail: what exactly a cash buyer’s list; what info you need from every cash buyer; what you need to do in order to build a buyers list; how to obtain vital info to continually grow your list; how to communicate with buyers on your list and more. Jack: …Jack Bosch speaking here. Jack: …18… In episode number 18, we are going to talk about a little bit something else. But, before I tell you what we’ll talk about, I want to let you know that we have a free gift for you. And, the gift is a free tax delinquent real estate investing quickstart course that actually covers all the five real estate investing techniques that we usually use that are responsible for our 3,000 deals or actually 3,200 going… Our next goal is obviously to hit 3,500, since the end of 2002. So, in the last 13 years, we have done over 3,200 deals and all of them were done in one or the other of these five techniques that we give you a free quickstart course on when you go to www.ForeverCashFreedom.com. Again, ForeverCashFreedom.com. Also, already ahead of time, I want to mention to you that the podcast notes about this podcast will be located under www.ForeverCash.com/Podcast. Again, www.ForeverCash.com/Podcast. There’s going to be the audio downloadable. There’s going to be tweetables that you can take and tweet out there to the world about the podcast if you like it. There’s going to be a transcript as PDF or a transcript of the podcast. There’s going to be the links, all the links that we mentioned throughout this podcast right now. You can actually look them up right there. Michelle: I also think that they can rate us there. But, if they can for sure rate us on iTunes when you are done listening to this podcast, if you could give us a review, that would be great. We’d love to hear it. Rate us one star if you don’t like us, five stars if you like us. Jack: Of course, preferably five stars. Michelle: Five stars is preferred. Absolutely! Jack: Right! And yes, you can do that on iTunes. There’s a link there you can click on where you can rate us. Reviews, I think, are only passed through directly on the iTunes software, but I might be wrong there, but you can definitely rate us with one to five stars. Michelle: And, one more thing is that if anything that Jack or I say during this podcast triggers any questions on your end, we would love to start interacting with all of you. So, if you could go to our Facebook Forever Cash page and post your questions, we’ll more than likely go ahead and answer your questions in ongoing future podcasts. Jack: All right. So, Michelle, what are we going to talk about today? Michelle: So, today, I know we’ve talked about how to acquire the properties and all the different angles to go about finding a tax delinquent real estate. So, today, I thought we’d do something a little bit different and we talked about… Okay, so we have the property already, and so, how do we start selling and marketing this property? So, I would like to talk about the principles behind building a buyers list. Jack: All right, a buyers list. I love that concept. Wait! Thank you for selecting that for today’s podcast. Michelle: So, first of all, I think we should start by basically explaining what is a buyers list? Jack: Yes, absolutely. Okay. So, may I take that part? Jack: Absolutely. I can talk day and night about buyers list. I absolutely love it. Well, in short words, a buyers list is what the word says. It’s a list of buyers. Ha! Now, we got it. It’s not just a list of buyers. It’s a list of people who are interested in buying. Because technically, per definition, a buyers list would just be the people who already bought and if you’re a starting buyer or if you’re a starting investor, you might not have anything that you have sold already, so therefore, you wouldn’t have a buyers list. So, a buyers list is not a list of people who have bought from you. It’s a list of people who potentially will buy from you, and once you are down the road and have done a few deals, it includes the people who actually have bought from you too. So, first of all, very simply, that’s a buyers list. Now, a buyers list is… Typically, what you have from these buyers is you have a name, you have a way to contact them, be it an e-mail or a telephone number. Michelle: Areas of the country, size of properties. Jack: Exactly! Areas of the property, areas of the country, size of properties. Are we looking for pieces of land? Are we looking for commercial? Are we looking for three bedrooms, two baths under $200,000? Are we looking for properties between $200,000 and $400,000? For luxury properties, basically they will tell you what it is, and then you can categorize the people in subcategories, in sub-buyers list within your buyers list. Michelle: Okay. So, what do you need at…? Let’s start at the beginning. What do you need to do in order to build a buyers list? Jack: All right. In order to have a buyers list, I mean, buyers list have really been around forever. Because, think about it, if you go to your local pizza parlor and they have like the fish bowl, the glass fish bowl there where once a week they raffle up a free pizza to everyone that puts in their business card, at the end of the day, what they are building up there is a buyers list. They are building up a list of potential buyers and existing buyers because chances are, you actually have bought from them if you are going there and leave your business card at the counter which is right next to the cashier. But, the bottom line is they’re building up a list of people that they can reach out to when they have a special or when they have something or a specific promotion or so and can invite to come back in. And, that’s really what the buyers list is. A buyers list is people that you can contact when you have something special to offer. Michelle: And, if they are a resourceful pizza owner, they would probably send out a promo e-mail around 4:00 or 4:15, right before dinner saying, “On your way to work, we have a large pizza with three toppings for only so and so. It includes cold drinks. It includes this. It includes that. And so, you would use that buyers list, either phone number or in this case email, to go ahead and send out promos, I guess, like Jack just suggested. Jack: Exactly, right. By the way, we are a husband and wife team so if we goof around or if we jab at each other, it wouldn’t be expected any different, right? So now, what do you need to build a buyers list? So now that we know what a buyers list is… It’s a list of people that potentially will buy from you and some of them have already bought from you and perhaps will buy again. We need to figure out what do we need to build this and what do we later on need to actually communicate with them. But, first of all, let’s talk about what to build and what we need to build it. Well, first of all, we need a mechanism to capture the buyers’ names and contact information. And, that mechanism in the offline world is the fish bowl. In the offline world, for example, in the real estate agent world, it’s the guest spoke at an open house. Michelle: Or, for example, I go to a lot of ladies or women networking groups, and the way of doing it is you put in again your business card and you enter a drawing and at the end of the event, they are going to raffle off something. But, at the end of the day, what they are doing is they have my contact information, they have my phone number and they have my email. Jack: Exactly! And, what they offered as a drawing was the bribe. Jack: It was an ethical bribe that has been called to lure to get people’s information or to make them be willing to give that information to you. Now, the open house is very simple. The lure is to go see the inside of that house and that’s why you are willing to actually open your… Well, you’ll grab a pen and put in your information, or if you have a card, leave the card with the realtor behind. Now, that’s the offline world. In the online world, it happens to something that’s called an opt-in page. Some people also refer to it as a squeeze page because basically in order to get through there, the person that has the opt-in page will squeeze out of you your name and e-mail address. So, it’s sometimes is called the squeeze page. Well, let’s call it an opt-in page. So, you’ve probably seen them around. Even the president of the United States has one especially when they run for president. When you went to Obama/Biden 2008 or even 2014, what you saw was or is it… Was it 2014? Michelle: We have our political facts down. Jack: We have our political facts down. So, if you went to Obama/Biden 2008 or 2012, at least we are smart enough to catch my era here so… And, you would have found a blue website with one field on it and that one field allows you to put in your name and e-mail address. And then, there is no way to find out anything on that website. You first have to squeeze in. You first have to opt-in even on the perspective or in that race in 2012 even at the sitting president’s website. It’s pretty interesting how this works. Now, the online world is full of them. You see them all over the place and there are really three different versions of them. There’s the one where you cannot do anything but leave your name and e-mail address or leave. Another one is where you have like a restricted vision into what is being offered. Let’s say you can see some rough details, but if you want to see all the details, you have to give your name and e-mail address. And, the third one is where you can navigate everywhere and if you see enough value around, or like at the women’s meeting, if they raffle something off, then you are willing to perhaps give your name and e-mail address in order to participate in the chance of winning something. Jack: And, that really brings us down to the point of what you need. You basically need an opt-in page, and then you also need something to offer to the person coming to your website. You obviously need a website for an opt-in page obviously. An opt-in page is the website. And, secondly, you need a bribe. You need to offer something. AQNow, if you offer… In real estate, it’s very, very simple. If you have a smoking deal, then that smoking deal already is enough of a bribe or is enough of a lure for people to give you their name and e-mail address. Because basically, you just simply tell them, “Hey, come over here. I got a property in this and this neighborhood at $50,000 below value. Go check it out.” And, they want to see it, and the only way they can see it is by first giving you their name and e-mail address. Michelle: Or, join my VIP list, and you’ll be one of the first ones to be notified of new deals in such and such area. Jack: Absolutely. That works too that you do that. It’s a little and not as strong as like the individual property. Jack: And then, you just say on your website everything is sold out even if you haven’t really sold anything yet which is basically a little trick around there. Michelle: So now, we have a website. We have our opt-in page. We have our reward or bribe or their incentive for opting into our website and now what? Jack: And, now what? Well, we also need a place where we can capture those names. Jack: So basically, when they come to your website to give you their name and e-mail address, when they first entered, it needs to be saved somewhere. Now, there are tools out there like AWeber.com, like Constant Contact, like iContact, like… You name it. There are lots of these services out there. I just mentioned three of them. And again, you will find them listed in the podcast notes too under the ForeverCash.com/Podcast, but they’re listed there. Michelle: How do you find the buyers? And for example, I know you can list your properties on free sites because we’ve done that in the past. We’ve also listed our properties on paid sites, for example, especially the land deals. We have web pages such as LandWatch and LANDFLIP. Well, we actually pay for a listing of a property, and then have a link that brings them on to an opt-in page, and then into our website where they can see a whole repertoire of properties or inventory in the areas in which they are interested in buying. So, you can still put a logo unto you website with a clearly identifiable name of your website. And, people are going to write it down, go over to your website, go over to a web browser and type it in. That’s one way they can get over there. And, of course, you don’t bring them to your website. You bring them to your opt-in page so that you can capture their names. So then, you can do that. You can put your phone number. And then, when people call you, you can ask about their name. You can ask them for their e-mail address so you can send them some details about the property and you can ask them obviously for their phone number which you pretty much have from the caller ID. Michelle: You can have a link, I think, there. Jack: Yeah, yeah. You can have a links in there. You can even embed your own opt-in page in that actual listing, and that listing is being shown alongside with all the other pieces of real estate on eBay, and eBay is one of the largest real estate sites in the world. So, therefore, that totally works too and is a great source of leads or for inexpensive and high-quality leads. Michelle: Uh-huh. Anything about Pay-Per-Click that you want to talk about? Jack: I mean, I can. We like doing Pay-Per-Click over to our website, SunnyLand.com. What we do is we actually don’t send them to the regular page. We send them to a soft page of the page where they get a subset of properties. So, for example, if we advertise real estate land for sale in Arizona, we bring them to an Arizona specific part of our website and we’re using as an opt-in page, that kind of middle level opt-in page, where basically they can see the property or some of the property details. But, if they want to see all the property details, they can only do that if they go and give us their name and e-mail address. Jack: After they give us their name and e-mail address and press enter, it will then bring them to that particular property, and then they can move around freely afterwards. So, they can move around somewhat on the website, but they cannot see the exact details of the property without giving us their information. Michelle: Uh-huh. Now, I would like to talk about a little bit on how you communicate with your buyers list. Because, if your buyers list… If you are not in constant communication providing some sort of value to this list, the list kind of like dies off. Michelle: They forget you. They don’t open your e-mails. And so, there is a protocol on communicating, what you communicate, how you communicate and how often you communicate. So, do want to talk about that? Jack: Sure, I would love to. Well, there’s obviously… I’m sure there are multiple different ways to skin that cat like there is in everything, but our way has worked very well for us. And, the way that we do it is the moment somebody comes in to us into our buyers list, we are sending them one e-mail a day for the next 10 days. Jack: …And reliable, and they ship overnight and so on and so forth. I mean, how many people would buy from a real estate website the first time they see it? Well, only crazy people probably. But, the thing is they will buy once they trust you. Michelle: Yeah. So, you need to build that confidence through these series of e-mails so that eventually a person buys from someone that they know and trust. Eventually, they’ll pick up the phone. They will ask you questions about a particular property. In general, you’ll have a nice conversation. You can ask them more questions while you have them on the phone as to what specific properties they’re looking – the areas, the sizes, their sweet spot in terms of price and so on and so forth. And so, that’s all information that you then use to categorize that person for future communication. Jack: Absolutely! But the first step is making them or helping them trust you. And, the way we help them to trust you is by sending them 10 different prewritten e-mails, each of which brings them back to SunnyLand.com or to our website, and bring them back for them to look at our website and to a different part of our website. Jack: …A Thanksgiving special, a Christmas special, whatever it is that kind of specials that we run. And, we run a special at least once a month on the different properties that we sell, because again, our bread and butter is still the land. And, in order to flip 20, 30 pieces of land, you got to run a few promotions and have a nice buyers list. Michelle: Yeah. And, for flipping houses, how…? I mean, should people follow the same steps or are there other ways to tap into other people’s buyers list? 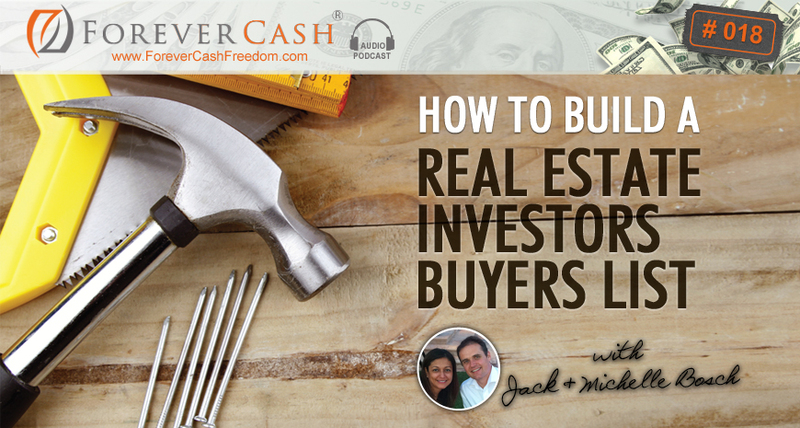 Jack: Well, for flipping houses, in order to build your own buyers list, it’s the exact same process. The absolute is the exact same process. There is an option where if you co-wholesale a property with somebody else, then you’re also tapping into their buyers list, because chances are, they already have done exactly what I just talked about. They might already have a buyers list of 500, 1000 perhaps. A friend of mine has 40,000 people on his buyers list. So, when you have a deal or when I have a deal, and it’s perhaps a little skinnier deal and nobody in my buyer’s list wants to buy it… Particularly, if it’s in a house area, in an area where my buyers list is perhaps not very strong, I can reach out to him and we co-wholesale it. Meaning, we’re splitting the deal or splitting the profit in the deal, but usually has it sold in one day because he has a buyers list that’s 40,000 people strong. Michelle: And, provide something of value or something about, “Did you know that such and such a market is booming and these are the benefits of investing in this area or so?” Basically, you have always a reason to communicate that could be of value to your buyer. Jack: Even if it’s just once a month, you couldn’t have said it better, exactly. And, that’s really how you deal. Those are really the principles of building a buyers list. Build them up. Capture every lead. There should be no lead placed left behind. Every person that calls you on the phone by e-mail or online needs to know about the property, needs to be captured, needs to be added to that list. And then, make sure you foster them, you communicate with them, you treat them well, you give them value, and even if you have no deals, communicate with them on a regular basis, even if it’s just once or twice a month, and letting them know about different changes in the market or anything of interest that you find. You don’t have to even write it yourself. If you can send them an interesting article that you read somewhere and say like, “Hey, I just found this in the news. You might like this,” it continues to build up your position as an expert in the market and build continuous building trust so that when you have a deal and the deal is being sent out, you have an active audience that actually will open your e-mails, look at the deal and boom! Jump on the deal and buy it. Michelle: Okay. So then, with that, I think it is a wrap. And, if you are interested in much more detailed information on how to create a buyer’s list, I would actually like to invite you to our August event here in Phoenix. It’s August 21st through the 23rd. We’re actually going to be talking on everything that’s tax delinquent real estate investing related and it’s a no hype seminar. It’s Jack teaching all three days of pure content. Jack: And, since it’s in Phoenix, I might have a chance to get Michelle on stage too. Michelle: Yeah, absolutely! I’m looking forward to that. I have done in the past, but it’s usually more the operational side of teaching, and if this is a little bit of more of like an intro to people, I think Jack is probably your guy. Jack: And see, I’m going to do most of it, but I’ll probably have Michelle speaking on stage on some sessions too. And yes, it’s in Phoenix, Arizona on August 21st to the 23rd, 2015. And, because you’re listening to my podcast, you actually get a discounted ticket. So, you can go to www.ForeverCash.com/PodcastLiveTickets. Let me say that again. Again, it’s www.ForeverCash.com/PodcastLiveTickets. And, when you go to www.ForeverCash.com/PodcastLiveTickets, you actually get a substantially discounted ticket to my live event in Phoenix, Arizona three days all meat. We’re talking about land flipping, house flipping, how to find the most motivated of all motivated sellers and how to find deals that you can buy for $300. Right now, we just got a testimonial from one of our students. She got a piece of property worth $125,000 that she paid $3,000 frankly on no mortgage, $3000 for it, and she already has a cash offer on the table for $90,000. She’s probably renegotiating that to $95,000 so that she nets $90,000. But, how would you like to spend $3,000 on a deal, and then make a profit of $90,000? She might be there at the event. If she is, I will definitely highlight her and make sure everyone gets to meet her. We have lots of successful students at our event that you can mingle with. We have a VIP session. We have all kinds of different things. So again, if you go to www.ForeverCash.com/PodcastLiveTickets, you can get a steeply discounted ticket for the event. Again, like last time, all of these links that I mentioned, the meeting notes, and the links to everything I mentioned is available on the podcast notes which is on ForeverCash.com/Podcast. With that, I believe it’s a wrap. Michelle: It is a wrap. Give us a review. Tell us if you like this. We will love to hear. Jack: All right. Thank you very much. Buh-bye.